Hear What You’ve Been Missing! Reduce background noise such as hums, electrical interference, air conditioners and tape noise to improve the clarity of voices and other audio evidence that are important to your case. Boxed Version: Both AS & VST plugins w/dongle – movable between systems. 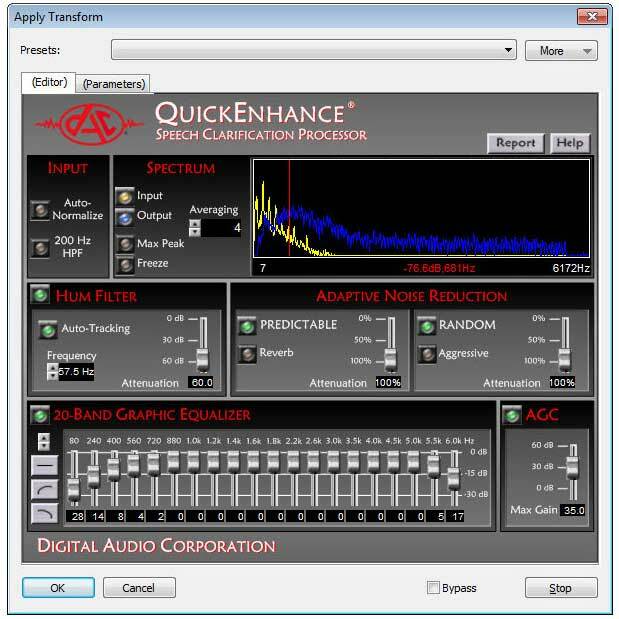 The DAC QuickEnhance Forensic Audio Clarification Plugin is now supported by a larger set of programs including Adobe Audition, Audacity, Avid Media Composer 8 and more via v2.3.0 AS and 2.3.2 AAX/VST 64bit versions. The AAX Avid Media Composer version and VST version are available as a download demo from the Free Trial tab. 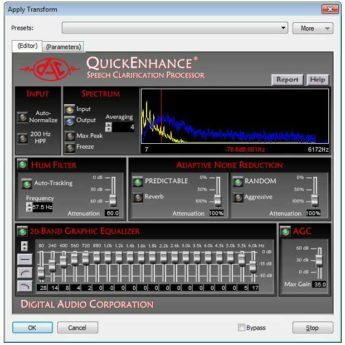 DAC QuickEnhance previously was only available as an Avid Audio Suite (AS) plug-in. Now a VST plug-in has been released. This expands the editing platforms you can utilize the audio clarification processing provided in QuickEnhance. (AS) Plug-ins: Compatible with Avid products such as Media Composer and Pro Tools. (VST) Plug-ins: Compatible with: Acon Acoustica, Sony Sound Forge, and Adobe Audition, etc. Adobe Audition. Demo version available. Digidesign Pro Tools systems version 6.0 or higher. What version of QuickEnhance do I need? QuickEnhance VST filter is listed in the Acoustica plugins folder but it is grayed out. How do I access QuickEnhance in Avid Media Composer? Download the latest version of QuickEnhance. Acon Acoustica Basic Edition is a free audio editor that supports VST plugins. Complete and submit the Download Request form below and your download will begin automatically.